If Kazunori Yamauchi had a few extra years to work on Gran Turismo 5, it may have had an open world component. 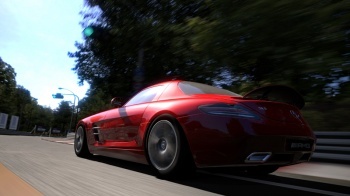 Polyphony Digital head Kazunori Yamauchi recently fielded questions from Gran Turismo 5 fans on Twitter where he revealed that the game could have had a mode reminiscent of Grand Theft Auto, minus the car theft and murder. Yamauchi mentioned that he wanted to add a free-roaming mode to Gran Turismo 5, but didn't have the time. A NeoGAF member translated a fan question that asked about a free-roaming mode for Gran Turismo 5's cities where players would be able to drive around and obey traffic laws, sticking to the speed limit and getting out of the car to walk around and visit stores. Yamauchi replied that this was something he had planned for Gran Turismo 5. The free-roaming mode obviously didn't make it in, but it sounds like something that could have been both cool and really boring. Would you get pulled over for breaking the speed limit or running a red light? I'm not sure we need a realistic driving experience that replicates how real world roads work, especially if it adds even more time to Gran Turismo's development schedule. For the brief period that a mode like this might allow the player to actually break driving laws, it would provide some fun until accidentally crashing into a tree and having to report the incident to the insurance company, which isn't enjoyable at all. Still, maybe Gran Turismo 6, which is already in development, will include a mode that allows us to impress potential mates by driving past them at the speed limit in a really fancy car. Yamauchi doesn't appear to be thinking about that game just yet though, as he also mentioned that a "mechanical damage" update will be added to Gran Turismo 5 in the future, along with some sort of "credit" or experience system for online play, so the developer is still hard at work on his just-released baby.